In this solo episode of Turning Lemons Into Lemonade, I tell you about one of the worst days in my LIFE – not just my business. A couple of months ago, my 14 year old Cavalier King Charles Spaniel, Emma, passed away. Emma had been with me and Mike for 14 years, since she was just 12 weeks old. I told the story of the first night we picked her up, and the next morning, taking her spunky little self to Petco for all the puppy things she needed! Emma was truly one of the absolute best companions – as an 11 pound animal that would go into a bag, and under the seat on airplanes, never making a PEEP – she went just about every where I went within the continental US! Well, a few months ago, Emma passed away on a Sunday morning. And it WRECKED me! She had been becoming more and more frail, but I still wasn’t prepared for it! I spent an entire day in bed, sobbing. But on Monday morning, I had to get up and gather myself together and show up for my client appointments! 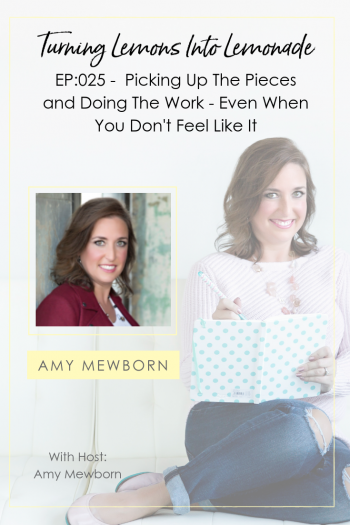 I talked about how mindset really made a difference in how I made it through that first week – still meeting my responsibilities – even when I wanted to crawl in a hole and cry for days!!! This episode is for all of you women who have had really sucky stuff happen in your life – that derailed your business! It’s a sad one – but SUPER real! I hope you enjoy the stories!